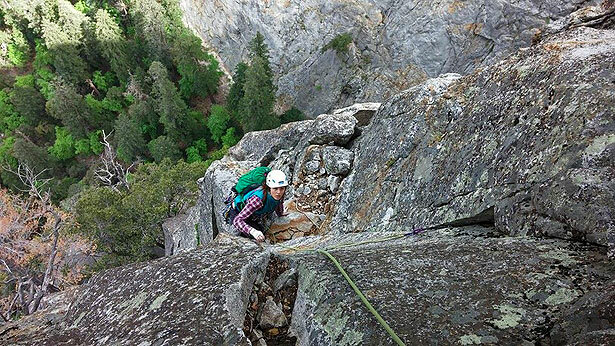 We were perched on the third pitch of the East Buttress of Lower Cathedral Rock in Yosemite. Storm clouds accumulated overhead, rain laden and foreboding, and as I gazed down towards Jon thirty feet below at the anchor, I contemplated down climbing and letting him have this pitch. “You’ve got this Alexa! You’re almost to the piton and then it’s over!” Jon shouted. We made distant eye contact. I evaluated my situation, aware that in reality, I was not almost to the piton, but had another thirty feet to go with no gear. I gazed again below and back up at the rising granite. Neither option was enticing. A few days prior, that small inkling of an idea to climb this obscure route imbedded itself in Jon’s mind. We asked our friends for beta, only finding one other who had knowledge of the route. His light response was rather reassuring: “I climbed that a few seasons ago. A little chossy, but pretty cruiser.” The generic reaction remained somewhere along the lines of “Don’t you mean Middle Cathedral? You guys will probably be the only ones this season on the East Buttress of Lower.” For some reason, I didn’t see that as a red flag. It had earned 2 stars in The Falcon Guide, nearly glowing in quality. We packed a double rack up to a #3 and one #4 camelot, setting off towards a route relatively unknown to us. Consequently, I’d now found myself gawking at a wide, 6-inch off width/squeeze chimney…not my forte. We didn’t bring gear wide enough to protect this pitch. I would have questioned that this dirty crack had never been climbed if it weren’t for the slung piton hanging alone, three-quarters up the route. The approaching weather pressured movement, however a pungent sense of fear overwhelmed me. I hesitated. Self-doubt snuck into my mind as I let that familiar dread overtake me. My mind kept jumping back to failure and consequence. I thought about where I would be if not here. I could be back in Colorado at my job. The numbing silence of an office; my coworker’s designer heels shattering the muteness with each step down the hallway. I just yearned for bare feet and a creek to lay them in. My phone would ring occasionally, informing me of a mistake I created inputting data, or of a project needing completion ASAP. My co-workers and I would converse small talk in the break room, and I would end my day in traffic trying to get a few pitches in at the climbing gym. I would fall asleep that night marveling at how people could live this monotonous life- in a box looking out. Twenty feet up the route; I wedged my body into the crack and took my helmet off, clipping it to my harness, letting it dangle below in order to turn my head. I scrutinized the rock before me, searching desperately for any opportunity of protection. A small chock stone sat near my feet, barely in reach. I hit the rock with the palm of my hand. A low thud countered. Not hollow but not solid. Questionable. This small chock stone was toying with my mind. Did I want to play this game? That question wafted a familiar scent. A parallel idea from a different world. I remembered asking myself something similar once before, looking out the window from the comfort of an office. My rope swayed below in the light breeze, attached to me but with no purpose. Finally, I placed a .3 camelot in the right side and slung it. As I tugged lightly, for one last check, the chock stone shifted outward ever so slightly, rendering my placement useless. Panic erupted in my mind. If the chock stone came loose, it could pull me down with it. I swiftly unclipped my rope from the piece where it again fell useless in the breeze. Emotions were on the verge of spilling over. I wanted to cry. A quote from the other day flashed in my mind: feel the fear, and do it anyway. I had no choice. Pressing my cheek against the rock, I closed my eyes for an instant and exhaled. Maybe the first time all route? The rock felt warm and comforting against my skin and the cool breeze tickled hair around my face. Time broke off, fell, and disappeared like the talus below. I felt no fears but of the present moment. Life seemed simple. I was not worried about money, relationships, or the fears of tomorrow, only utterly absorbed in that moment; the force of oxygen in my lungs, the throb of each pulsating muscle, the flex in my shoes as I attempted to create friction against this wall of braille. I continued stemming towards the piton; Jon shouting words of encouragement while I prayed that each micro-crimp and wavering jam would prove worthy. I grazed the palm of my hand across the rock above me, and found a small incut, just enough to curl three fingers over. It was miniscule, yet plenty. I tucked my fingers over the small crimp and stemmed even higher, joyously avoiding any offwidthing, and finally clipped the piton, relief flooding my body. I dipped my hand into the bag at my waist and let each small bead of chalk run through my fingers, then down onto my palm. My breath felt within my control now. With each step upward, another small incut would appear along the wall, almost magically, and my fingers would tuck mechanically over each one, like they were meant to be there. Finally, I found myself stepping onto the small belay ledge, adrenaline pulsing through my body. I roared in triumph and smiled into the sun. Blood pulsated through my veins and the strain in my muscles eased. I admired Yosemite’s roaring valley unfolding before me. El Capitan stood proud and resilient, towering over Lower Cathedral. Jon bellowed monkey calls from below. I quickly put Jon on belay and we continued up the route, putting one small victory behind us, soon hunting another. 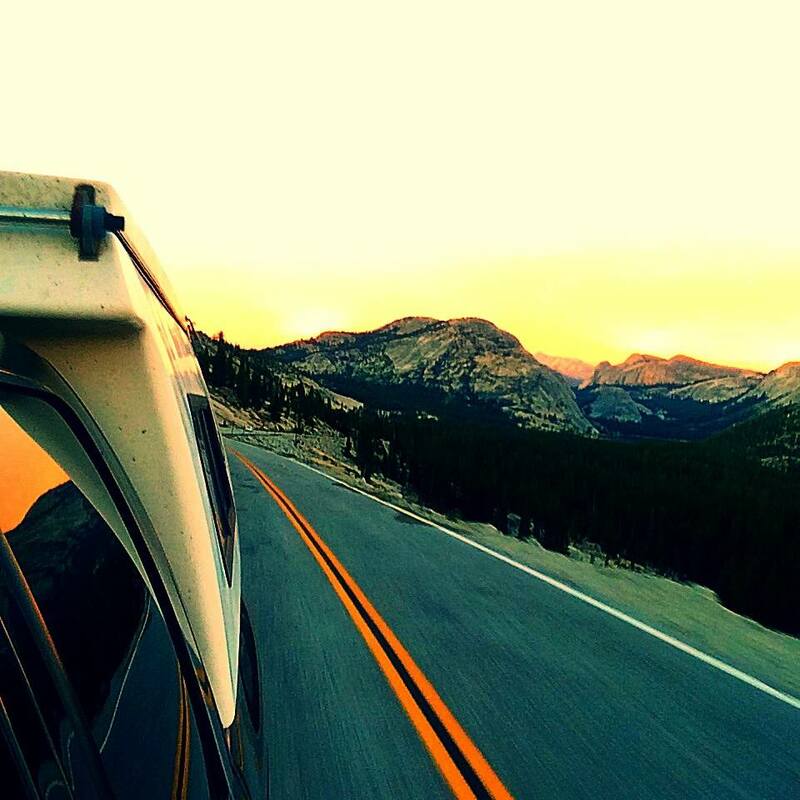 That evening, I headed up to the High Sierras, and rested in a tall grassy meadow, gazing up at the universe as the sun peeked back behind the mountains. The stars revealed themselves gradually, and my life seemed as vast and unknown as the sight before me. I remembered the light skid of my office chair rolling from one side of the desk to the other, the silent intensity in a weekly meeting with the executives, and the monitor’s droning buzz and exterminating energy feeding into my pupils. I blinked. My eyes troubled focusing on the unremitting screen day after day. I closed them again and pressed my palms over each one, a moment of disruption, before restarting the calculations- the PIFs, SKUs, the UPCs and RFQs. My mind would linger. I would reach for my phone and thumb through climbing podcasts. Enormocast or The Dirtbag Diaries? My mind would soon fade away, immersed in others’ adventures, inputting data automatically. After rehearsing many times, one day, I marched over to my manager’s desk, asking to speak with him privately. Adrenaline propelled through my body as I took action to a life altering decision and dream. I was ready to satisfy that hunger instead of continuing to pretend it wasn’t there. Feel the fear and do it anyway. I quit. I bought a camper on craigslist. I took off to Yosemite. I continued to gaze above into the masterpiece being painted before me, my mind wandering through the time continuum of my life. Not in a disparaging manner, but with the same peace I had found earlier that day on the climb. The cool breeze and quiet darkness was calming. I again felt neither fears of the past nor anxiety of my indefinite future. How could I regret the events that brought me to marvel at the sight before me, in this moment alone? And if not for the mysterious unknown, I would not have this ravenous fire to discover it. Embracing the unknown is surely challenging. Leaving my job with no impending plan, I again felt run-out, my last piece of protection far below, and an unfamiliar path to charge into. I know that I will again struggle between focusing ahead and contemplating the consequence of failure. That familiar sense of fear and anxiety will sneak back in. However, when desperation is on my doorstep, a small opportunity, maybe merely enough to curl three fingers over, will allow me to move forward. An opportunity that was always there, I just have to take it.